Floor time in the classroom provides a new perspective on playtime in the classroom. The approach recognizes that children learn valuable skills as they play and though it is typically used in home-based therapy, many are looking to the classroom as a viable option. A major benefit in using the DIR/Floortime model is that the approach is helpful to children with autism and children with normal development. Parents, therapists and teachers can adopt play therapy into the child's treatment plan and they can gradually introduce other children into the therapy. The program focuses on play, using a systematic approach that often yields excellent results. However, some challenges exist when using floor time in the classroom setting. Floor time does pose some challenges because it does focus on play rather than academic learning. The strategy helps children develop relationships and it can be very effective in promoting language. Some challenges teachers may face when working with the DIR/Floortime model in the classroom can be overcome, but it helps to recognize them to make a plan of action.Floortime is child-centered and it follows the child's lead. 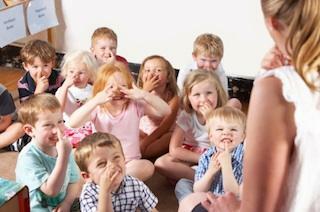 This can be very difficult to do in a mainstream classroom with a large number of children. The therapy is typically one-to-one, and giving such focuses attention on one student is challenging. The approach encourages the person working with the child to find deeper meanings in her play behavior, recognizing that behavior has purpose. This type of analysis requires one-to-one focus that may not be realistic in all classroom settings. Use the therapy for children in preschool and kindergarten. This helps students develop early learning skills normally developed through play. Typical children learn the skills naturally while children on the spectrum may require a systematic approach like Floortime. Focus on target play skills that are useful in the classroom setting. Creative thinking, logical thinking and problem solving are integral to floor time activities. Encourage joint attention, which is the ability to pay attention to the same activity another child is attending to. Shared attention is a building block for the theory of mind (recognizing that others have thoughts and emotions that are different from yours). Encourage students to recognize social cues using visual and verbal prompts. Exaggerating your facial expressions and gestures offers dramatic examples that demand the students' attention. Be flexible with activities, following the student's cues. For example, if a game of hot potato in full swing and the child begins to run, change the game to a hot potato tag game. Periodically evaluate behavior before judging it and consider the function of behaviors before responding. Using the DIR/Floortime model in the classroom setting requires considerable skill but it is a very enjoyable technique for teachers and students. What can teachers do to make sure that the strategy is effective in helping students reach their goals? The list may seem overwhelming, but if you begin with observing the child's behavior, the checklist becomes second nature. There are many benefits of using the DIR/Floortime model in the classroom. When it comes to using the approach in the classroom, one of the most important benefits is spontaneous learning. Classroom activities often rely on rote memorization, which can be very easy for children on the autism spectrum, but it is extremely important to help children make connections with what they learn in school to their everyday experiences outside of the classroom.